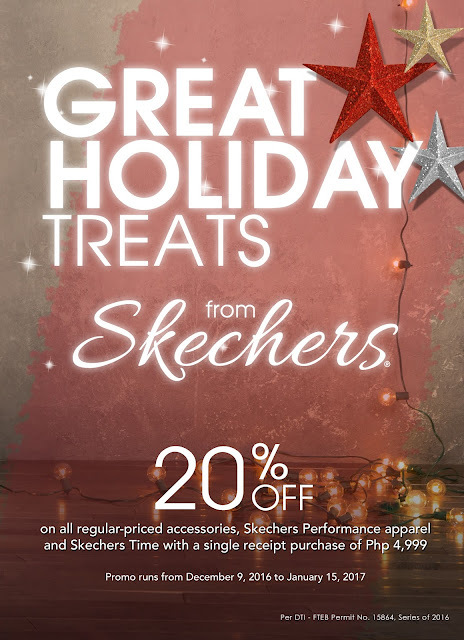 Home / Beauty / Christmas / Fashion / holiday treats / sale / shoes / Skechers / Get Your Holiday Treats from Skechers Now! Get Your Holiday Treats from Skechers Now! ‘Tis the season to be merry with shopping bags filled with goodies from Skechers! Mark your calendars with Great Holiday Treats from Skechers happening from December 9, 2016 to January 15, 2017! Get 20% off all regular-priced Skechers Time pieces, Skechers Performance apparel, and accessories such as bags and socks, for every minimum single receipt purchase worth P4,999 of all regular-priced items. Don’t wait ‘til the last minute! Hurry and grab this deal at a participating Skechers store near you! Visit Skechers in Glorietta 2, Trinoma, SM North Edsa -The Annex, Gateway Mall, Market! Market!, Robinsons Place Manila, Lucky Chinatown, SM Mall of Asia, Alabang Town Center, Festival Mall, SM Southmall, SM Bacoor, Robinsons Gen. Trias, SM Dasmarinas, SM Lipa, Ayala Malls Legazpi, SM Fairview, Ayala Fairview Terraces, SM Clark, SM Pampanga, Marquee Mall, SM Cabanatuan, Robinson's Place Ilocos, Ayala Center Cebu, SM City Cebu, SM Seaside Cebu, SM Bacolod, SM Iloilo, SM Davao, LimKetKai Mall, and Centrio Mall. Update: The promo is only applicable to select Skechers stores nationwide.